What type, if any, of jewelry does she wear? Delicate pendants and pearl earrings? Swingy hoop earrings and bangle bracelets? Chunky statement necklaces and oversize rings? Does she love the vintage touches of Victorian or Art Deco designs? Does she always wear a particular metal color, or does she like to mix things up? How does she dress? Does she prefer a tailored, classic look? Does she love bold colors and patterns? Is she most comfortable in soft pastels and feminine designs? Does she have a friend, sister, or colleague with whom she might have shared her vision for the perfect ring? Does she have a Pinterest board where she may be saving pictures of designs she loves? 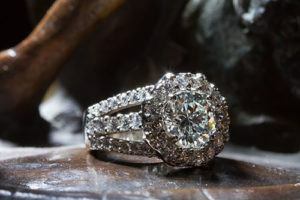 When you’re strolling past or through jewelry stores, pay attention to her comments, both positive and negative, and make mental notes of any particular design elements that appeal to her. Listen when she comments on her girlfriends’ or relatives’ rings. These can be subtle but useful hints as to what shape, size, and type of diamond or gemstone that she would like, as well as setting styles.